C.J. 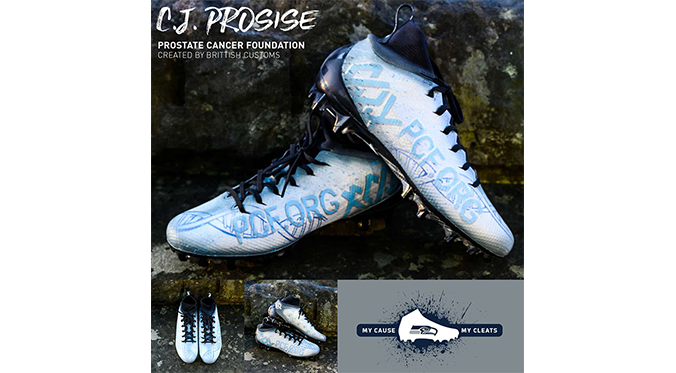 Prosise of the Seattle Seahawks will be wearing custom PCF cleats for the 12/2 game against the San Francisco 49ers as part of the My Cause, My Cleats campaign. After the game, the cleats will be auctioned off and 100% of the proceeds will be donated to PCF to fund research. Check http://auctions.seahawks.com/ next week to find the cleats and make a bid. More than 800 NFL players will showcase causes that are important to them with custom cleats during all Week 13 games, as part of the NFL’s My Cause My Cleats campaign.